Six football hooligans were jailed on Thursday for fighting before a Worthington Cup derby clash. The Luton Town fans were involved in what police said was an "orchestrated" and "arranged" fight outside the Moon Under Water pub ahead of the Watford and Luton Town match on 10 September at Vicarage Road. A total of 20 people have been jailed for crowd trouble both inside and outside Watford's Vicarage Road ground. The six Luton fans appearing in court on Thursday all pleaded guilty to charges of affray. Thomas O'Donnell, 37, from Peartree Road, Luton, was given the highest jail sentence of 14 months. The court heard he had two previous convictions running back to 1984 for football-related violence. He was also banned from football matches for seven years. David Gentle, 40, from Firecrest Street, Letchworth, with one previous conviction for football-related violence, was jailed for 13 months and banned from matches for seven years. Andrew Presswell, 38, of Haymarket Road, Luton; Anthony Clifford, 37, from Kingston Road, Luton, and James Carleton, 33, from Warren Road, Luton, were all jailed for 11 months and banned for six years. Alan Marcantonio, 36, of Swifts Green Road, Luton, was sentenced to eight months and banned for six years. 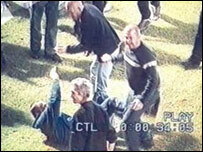 Fourteen hooligans were jailed on Wednesday for the crowd trouble on the pitch. On Thursday Judge Seddon Cripps also banned the 14 men from all football matches for periods up to seven years.